It has been a long busy weekend! We were in Chicago again, but I will tell you about that in a different post. I received these really fun board games. They are cooperative games. This means that instead of playing against each other, you are working toward a common goal. Hence the name Peaceable Kingdom. I really like games that encourage children to work together. Yes, we do play competitive games, but I appreciate having the ability to play a game where you work together. We received Seeds for the Birds ($15.99) and Snug as a Bug in a Rug ($19.99)! While in Chicago we had some young friends visiting with us and they really enjoyed these two games. As a matter of fact, I think they will be going home with them. J loved putting the bug in a rug. These two games are designed for ages three and up. The game play takes approx. 15 minutes with 2-4 players. There are different levels at which you can play for different levels of understanding. The game boards and pieces are colorful and attractive to children. These are just two of the games available from Peaceable Kingdom. These two games along with a few others won Oppenheim Awards. So not only do I recommend these games as a great gift idea, but obviously Oppenheim does too, as five of the Peaceable Kingdom games won awards! I am telling you these are fun games for young children and will make a great gift idea for under $20. I was also able to see these games and some of the others at ChiTaG (Chicago Toy and Game Fair) this weekend. 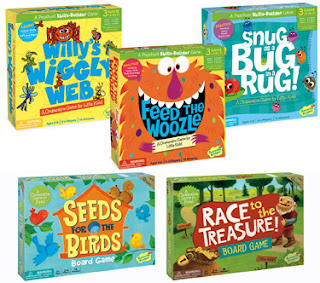 Take a minute to check out these games if you have young children to shop for! Be sure to "Like" them on Facebook! And then find them on Twitter, @Peaceble_K. Disclosure:I received no monetary compensation for this post. I did receive two games for review purposes. All quotes in red are taken from the sponsor's email or website. All thoughts and opinions are mine. We love their games, it helps teach the kids how to take turns and follow directions. They are so simple and keeps their interest. We haven't gotten the Snug as a Bug in a Rug yet, I think the kids would love this one as well.